542 pages | 35 B/W Illus. While preserving the clear, accessible style of previous editions, Applied Nonparametric Statistical Methods, Fourth Edition reflects the latest developments in computer-intensive methods that deal with intractable analytical problems and unwieldy data sets. Reorganized and with additional material, this edition begins with a brief summary of some relevant general statistical concepts and an introduction to basic ideas of nonparametric or distribution-free methods. Designed experiments, including those with factorial treatment structures, are now the focus of an entire chapter. The text also expands coverage on the analysis of survival data and the bootstrap method. The new final chapter focuses on important modern developments, such as large sample methods and computer-intensive applications. Keeping mathematics to a minimum, this text introduces nonparametric methods to undergraduate students who are taking either mainstream statistics courses or statistics courses within other disciplines. By giving the proper attention to data collection and the interpretation of analyses, it provides a full introduction to nonparametric methods. … this book has an effective organization and covers a wider scope of non-parametric methods than former editions. Therefore, I believe that this book can serve its intended audience. …The chapters have been substantially reorganized, and new material is provided on methods related to factorial designs and time-to-event data. An entirely new chapter, ‘Modern Nonparametrics,’ closes the text with a variety of topics … the worked examples are thoroughly and meticulously done … constant mention is made of the available software (e.g., StatXact, R, Minitab, SPSS) to conduct specific procedures. … solutions to selected end-of-chapter exercises are annotated and quite helpful. Overall, this is a solid choice for a first course in nonparametric statistics for undergraduates. … expands coverage on the analysis of survival data and the bootstrap method. … the new edition also focuses on some modern developments. The formal testing procedures are illustrated in a nice way with realistic examples leading to final conclusions, comments, and a discussion… The book has a clear style with well-organized material. 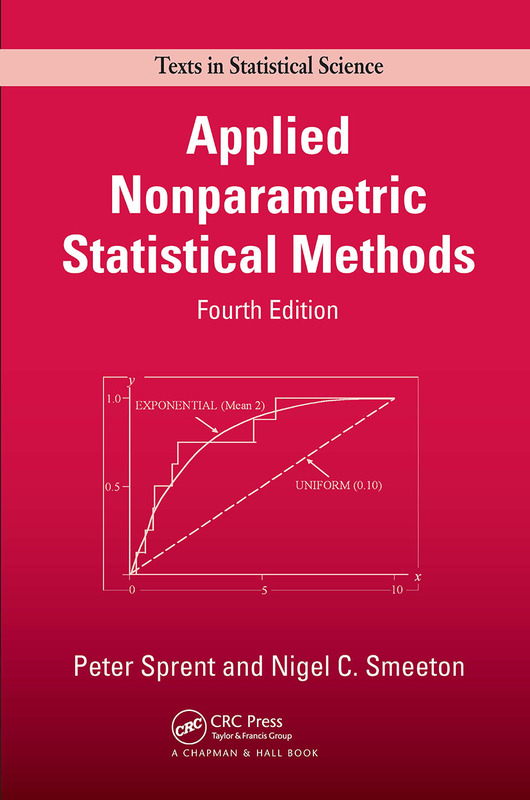 The book works well as a reference book for users of nonparametric methods in different research areas. It is also a good textbook for undergraduate courses in statistics as well as courses for students majoring in other disciplines. Strengths of this text certainly include its organization and writing style. Applied Nonparametric Statistical Methods provides a very clear exposition of modern nonparametric methods. Many students and practitioners will find it an excellent resource and reference for nonparametric statistics. … extremely valuable for statisticians as well as for researchers in applied fields. … This well-written book is highly recommended for those readers who want to get a feeling for the nonparametric methods which they apply when analysing their data. Exercises appear in each chapter.